Getting this error, seems to occur randomly, cannot recreate. Will pop-up a handful of time a day. I'm sorry about the difficulty. 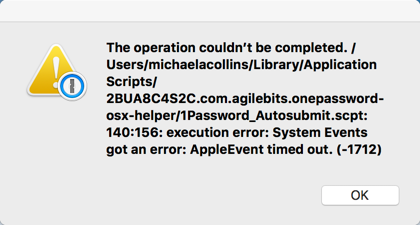 That error message is referring to the auto-submit script which is installed by the Mac App Store version of 1Password. It's a very simple script which simulates pressing the 'Enter' key after the 1Password extension fills your login information on a website. This version does not use that script. Close all browsers and 1Password. Does that help? Let us know how it goes and if you have any questions about that. Thanks!